I am plugging hot and heavy into virtual design and love it! This week in particular is very heavy with requests from Landrum South Carolina, Oak Island North Carolina, Montclair New Jersey, Indiana and Maryland. That is one busy week and I wouldn’t have it any other way! I just love virtual design. Anyway, I wanted to give you a sneak peek of some of the color palettes that I’m working on. I can’t share any photographs at this point but I can show you some of the colors that are on the table. Can’t reveal the names of the colors either (I know, no fun) but you can still see how beautiful they look together. What’s so amazing about ALL the virtual color consultations this week? They ALL want a coastal color scheme. With pleasure! This palette is for the first floor of a beach house. It has a very open floor plan and a lot of windows as a beach house should. This is the color plan so far for the kitchen. See the note I have on the kitchen color? That is HUGLEY important! So many people want a blue room BUT you have to be turbo careful which blue you choose. Pick a blue that is a little too clean and light and you might as well call it a nursery. This partially blue is perfect because as per my note on the color, it’s the perfect mix of pigment to pick up both the sky and water colors and bring it right into the house. Oh I love this!!!! Well I have to get back to the design board but I just wanted to show you what I’ve been up to. Be sure to check back, I’ll be posting about coastal color here for a while. 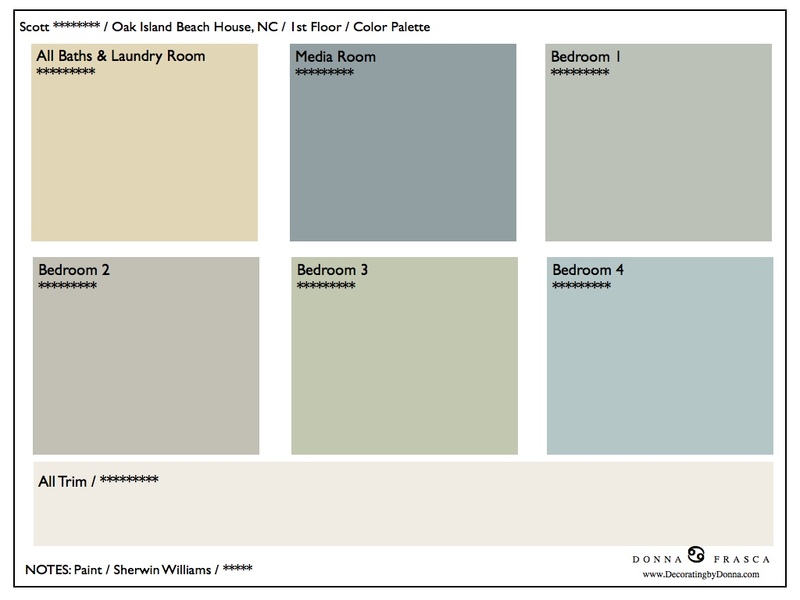 This entry was posted in Coastal Colors, Virtual Color Consultations and tagged color palettes, Landrum South Carolina, Montclair New Jersey, Oak Island North Carolina, virtual design. Bookmark the permalink. 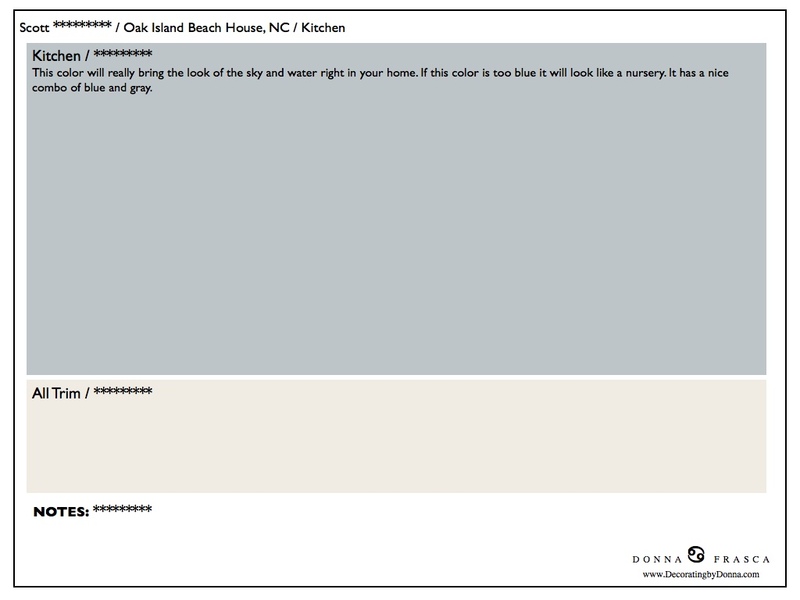 Hello, my client came across the Oak Island beach house color scheme. I believe they are SW paint colors. They liked the scheme and would like to get the colors. How do I go about getting them the name of the colors? Hi Shirley, I have a Color Ala Carte service where you can get any color in a palette for $15 each color. This palette would be $105. I see you sent me an email, I give you more details there.